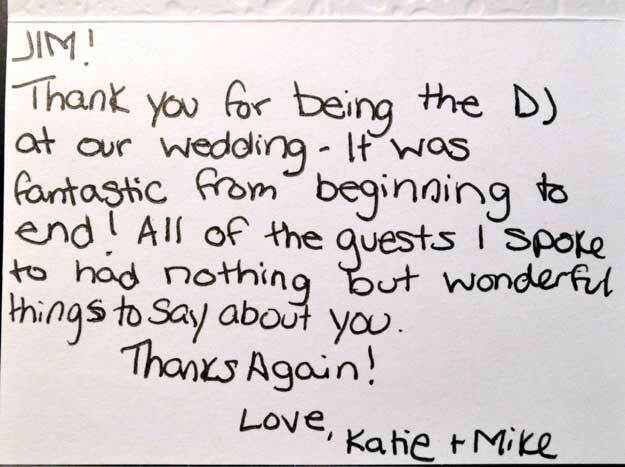 We couldn’t have picked a better person to DJ our wedding. At first, I decided to use Jimmy simply because I had a good feel from him on our first phone conversation. 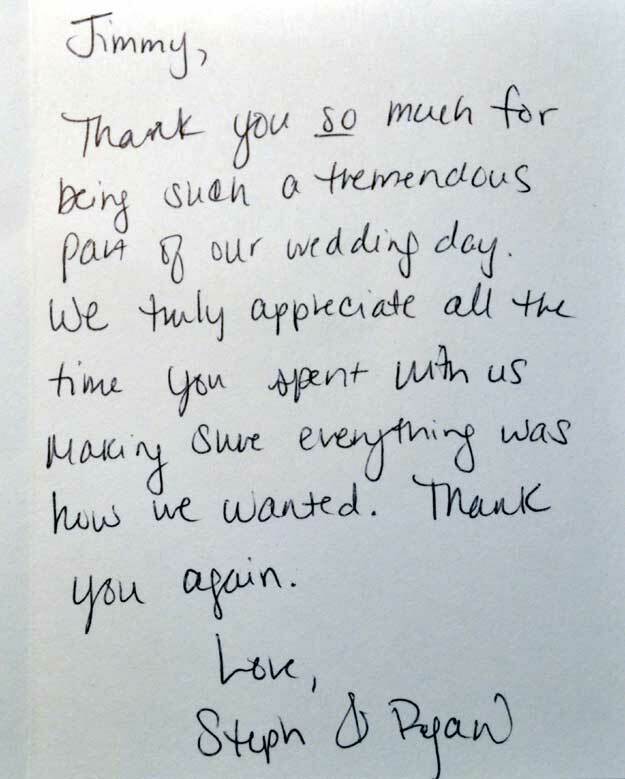 He made it clear that he was not cheesy, open to any music suggestions/songs that my fiance and I wanted, and was flexible with pricing. Since then he was quick to respond and when he did he was thorough. When meeting with Jimmy prior to our wedding, he made sure to really “get” the type of music that my fiance and I were into. 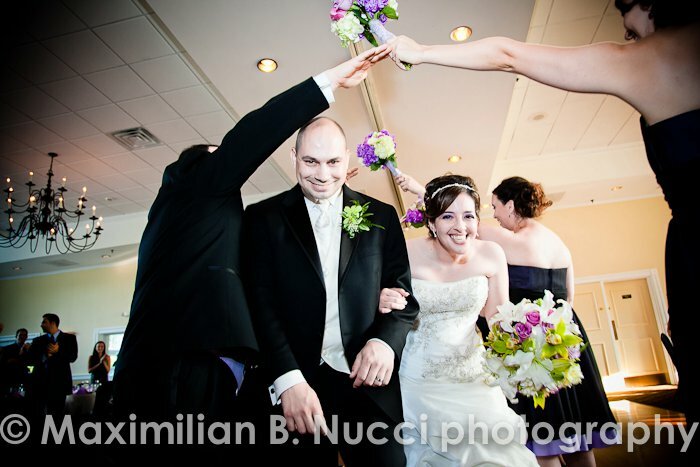 He was funny and accepting and really KNEW music for the different moments that would be happening at our wedding. While creating a list of songs that we wanted played, he was also able to suggest songs while even giving me a background on the artist and how/why they wrote that song. 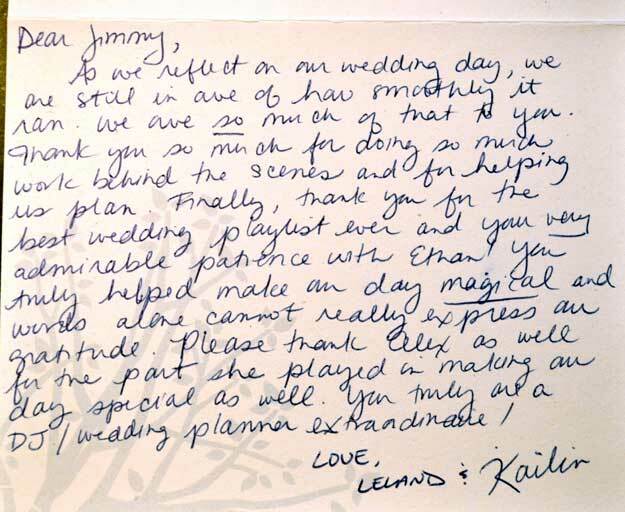 During the wedding Jimmy not only used our playlist but added in his own touch that was EXACTLY our style and EXACTLY on point for what would work well with our guests. There wasn’t a single moment that only a few people were on the dance floor. Jimmy was a pleasure to work with and we received many nice compliments about what a good job he did and what a nice guy he is. I would highly recommend using his services and know that you will be just as pleased as we were. My Husband and I met with Jimmy a few weeks before our wedding for two hours! He made us feel very comfortable and we soon learned that Jimmy had a great taste in music from Dylan to the Beatles and more. My husband and I have an eclectic taste in music from Lady Gaga to The Stones to Michael Jackson to Bob Dylan to 80’s rock, and right away Jimmy saw our vision and made it happen. I didn’t leave the dance floor for a second! Every so often he would surprise me with a song and I remember saying to myself, “How does he know I love this song? 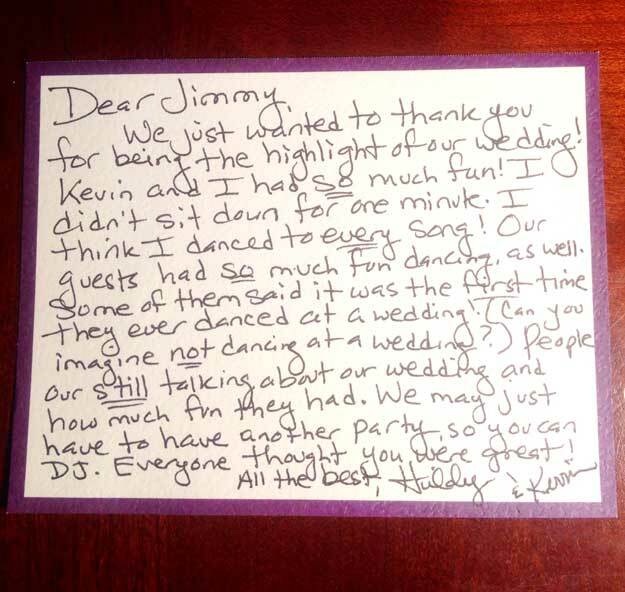 !” That’s because Jimmy really made an effort to know us, which is what made our wedding very unique and a pure, great dance party! 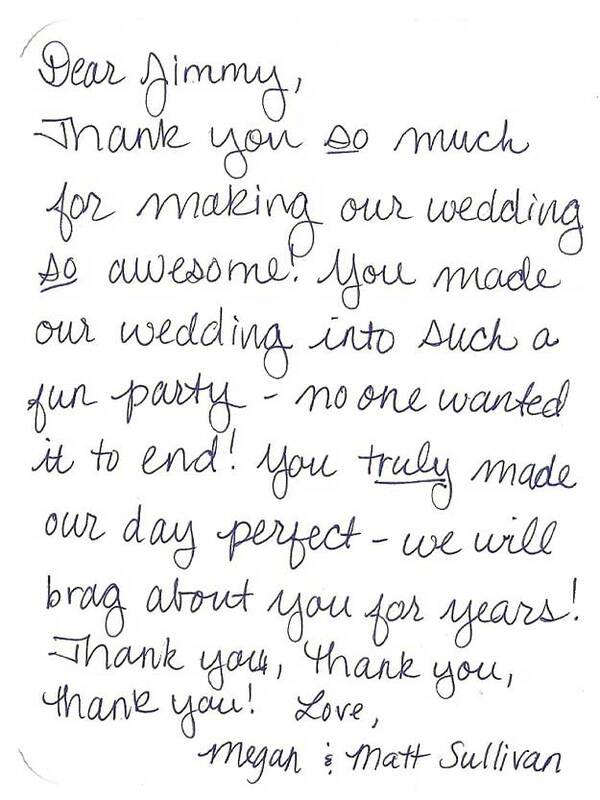 All of our family and friends have been calling us telling us what a great time they had! We couldn’t have been happier with Jimmy Lutz as our DJ & emcee! Do yourself a favor and reserve Jimmy if he’s free on your date. 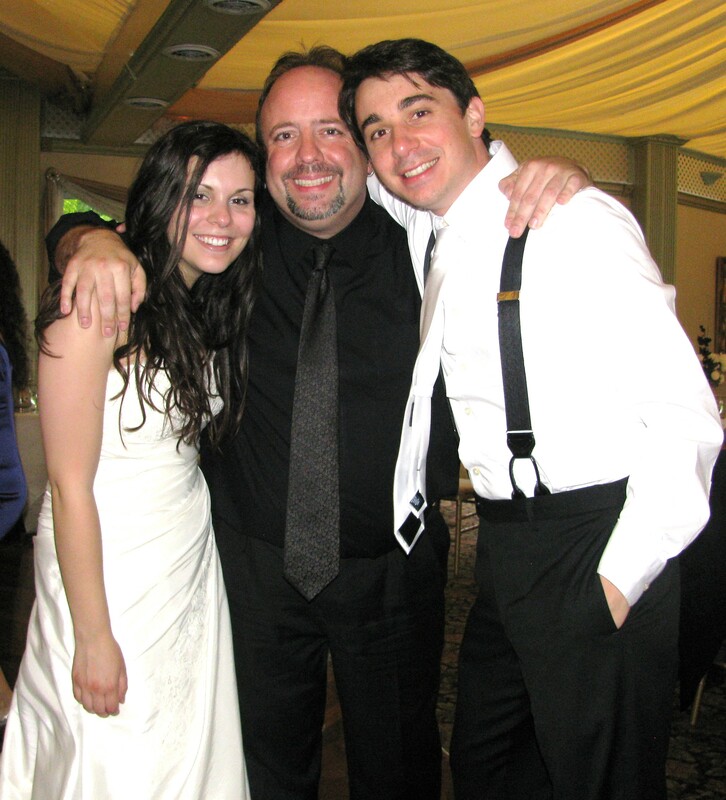 He took ample time around our crazy schedules to guide us through the entire process of choosing all of our wedding music and arranging the flow of the night down to the nitty gritty details which we either hadn’t considered, or seemed overwhelming until we met him. He did this all the while ensuring that the wedding would have the mood, energy and elegance that fit our personalities best. The end result was the best night of our lives, everything we hoped and dreamed it would be. 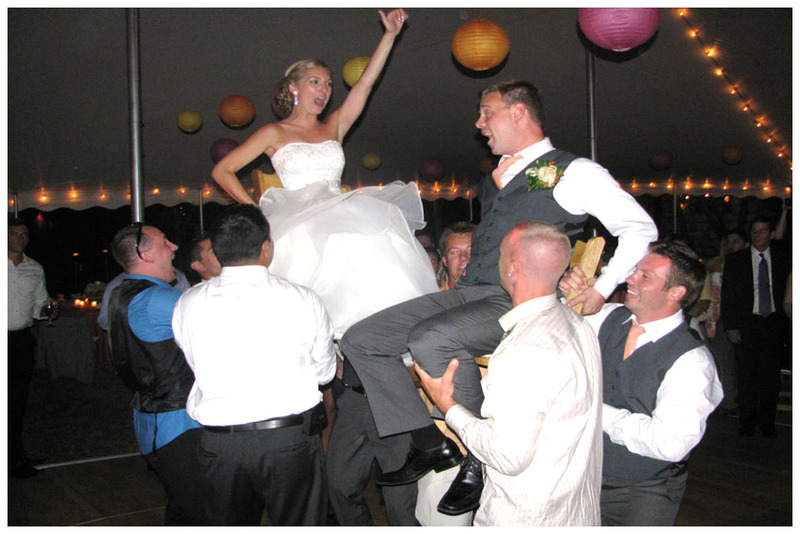 The wedding music was such a great mix, the energy was high and our guests were on the dance floor all night. I received so many compliments on the music and was even asked for a playlist at the end of our reception. Beyond the job that we hired Jimmy to do we learned that he is an extremely talented, kindhearted, and stand up guy that we are now proud to call a friend. So kindhearted that when he found out I was upset over my wedding dress alterations, he not only contacted some industry friends on my behalf, he even followed up with me to make sure everything turned out ok. It’s because of Jimmy’s hard work, help and desire to make our vision a reality that our wedding turned out perfectly! 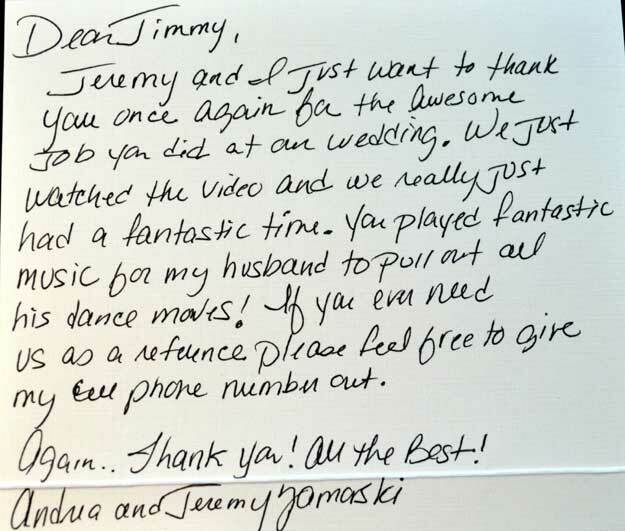 Jimmy was an amazing DJ, he really knows his stuff, makes people feels realy comfortable. All of our planning meetings, he was very flexible in dates , times, etc, he was extremely helpful in planning the flow of the reception. A true professional of his craft. I would recommend Jimmy with my out a doubt! Thanks for a great day Jimmy! Jimmy exceeded our expectations. He totally got our vision and love for different genres of music and made it happen. He even extended a version of “He’ll Make Me Happy” from the Muppets take Manhattan for my bridal party to walk down the aisle to. Our guests NEVER left the dance floor actually we couldn’t keep them off the dance floor during dinner which was fine with us! Numerous people came up to me during the wedding and said he was the best Deejay ever. 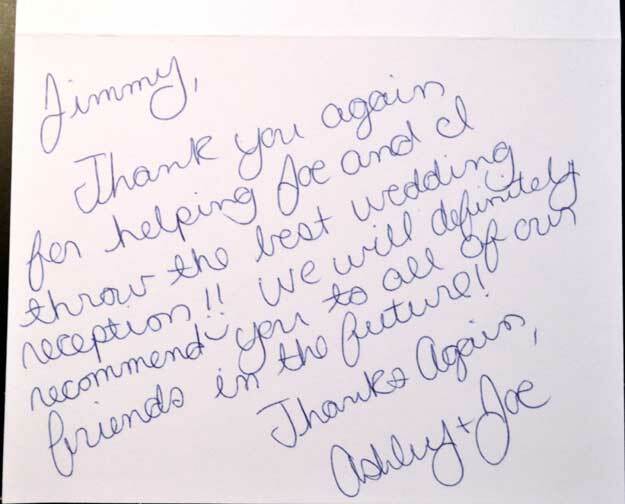 Jimmy takes a special interest in his clients and really becomes your friend though out the planning process and therefore makes your event that much better because he knows you. I would recommend him for any party or event and we definitely look forward to using him again! Would just like to say that DJ Jimmy Lutz is for sure the best DJ I have ever seen or heard. He made our entire Wedding experience so much better. He listened to all our suggestions and knew exactly what we were looking for after our first meeting with him. Our Guests were on the dance floor the entire night from start to finish. The mix of music was perfect and both him and his assistant kept everyone entertained. We couldn’t have asked for a more perfect experience. I would recommend him to anyone looking for a great event. I have already received multiple comments on how great a job he did at our wedding. Thank you so much Jimmy for making our night a truly special evening. We hired Jimmy Lutz to play at our reception in the Hudson Valley. We met with him prior to the wedding and he spent a long time with us discussing our wedding our music preferences and working out a timeline for the day of the wedding. He was always professional very responsive and overall just a great guy. 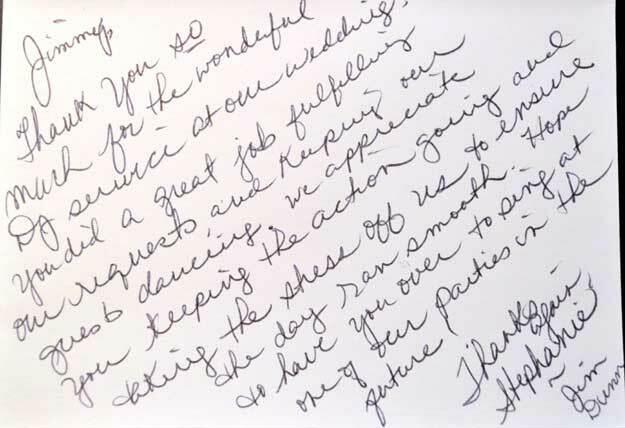 The day of our reception was wonderful – not only did he play the things we discussed but he also played the kinds of songs that make people put down their drinks and run for the dance floor with squeals of “I LOVE THIS SONG!” He got people to dance who hadn’t danced in years! 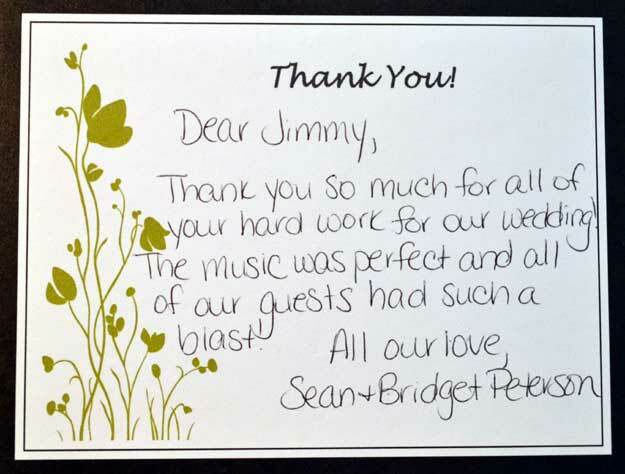 Our guests could not stop raving about how incredible the music selection was. I loved that all the women (including me) kicked off our heels and danced the night away. 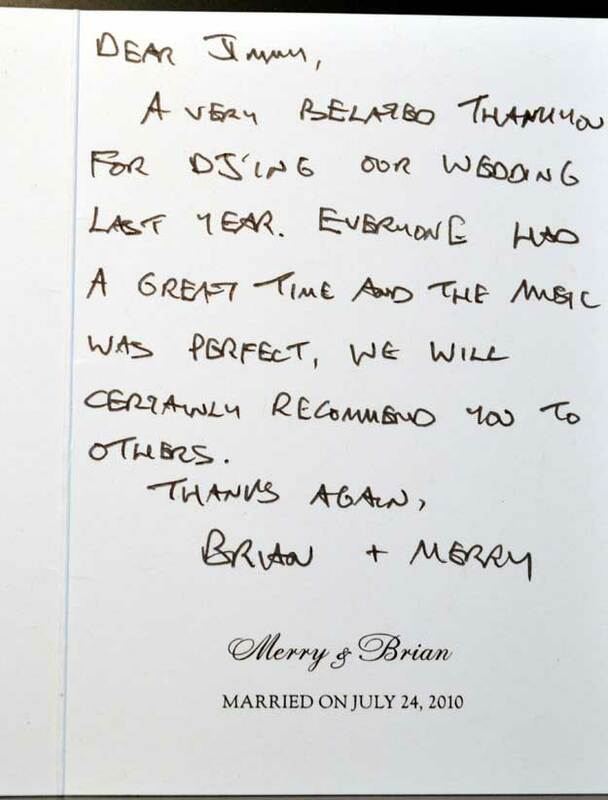 He and his assistant were so professional and so lovely – not only was the music amazing but he did a great job making sure that the reception stayed according to our timeline without being obtrusive in any way. 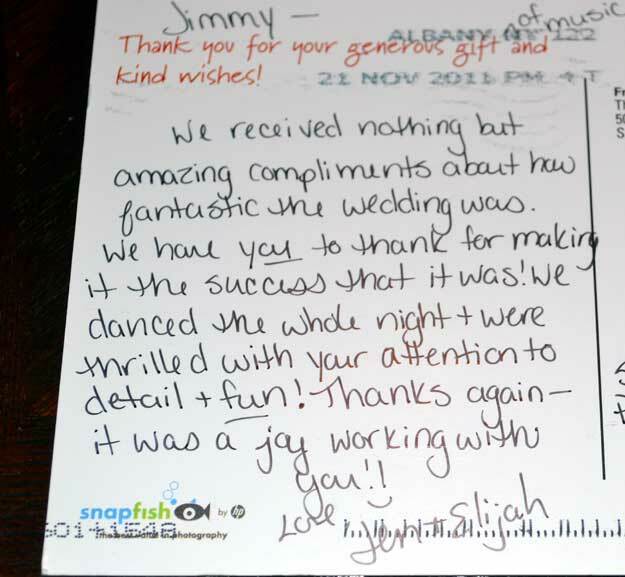 Some of my favorite memories from our reception involve us and all of our guests on the dance floor so thanks to Jimmy! My husband and I were thrilled with Jimmy. He was very easy to work with: fun professional flexible and considerate. He played the music that we requested but also used his discretion as a professional in the music industry to get the dance floor moving. We had many compliments from our guests on the music. He was also helpful in creating a time-line for the evening and keeping everything organized and on-track. There were no cheesy gimmicks per our request just some good music that added to a night of great fun. It was the hottest weekend of July (98 degrees!) and everyone was sweating but I have never seen so many people dance at a wedding. My friends are still talking about how it was the most fun wedding they have ever been to. My favorite part was the “snowball dance” to kick the evening off. It ensures that everyone gets on the dance floor. 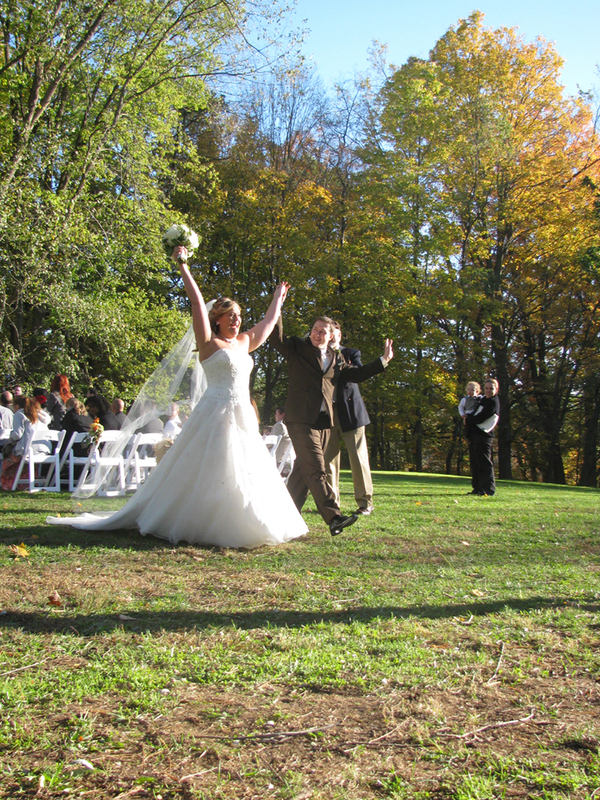 (The bride and groom start dancing then they each pick another person to dance and so-on.) 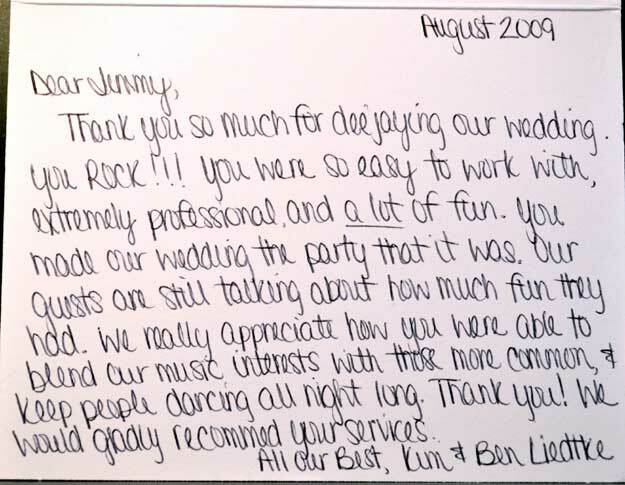 I thoroughly recommend Jimmy Lutz for a seamless and fun experience. My husband and I hired Jimmy based on reviews we found online. My husband is a musician so he was skeptical about hiring a DJ in the first place. 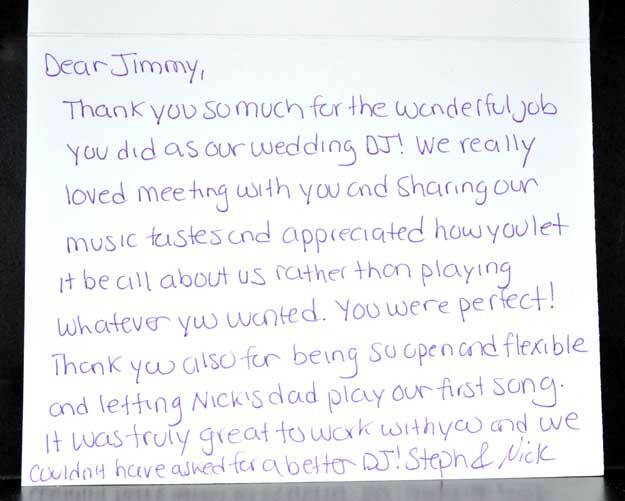 Jimmy exceeded all of our expectations for a DJ!! Due to us living in Boston we never had the opportunity to meet with Jimmy in person and had to review and finalize everything through email and phone calls. 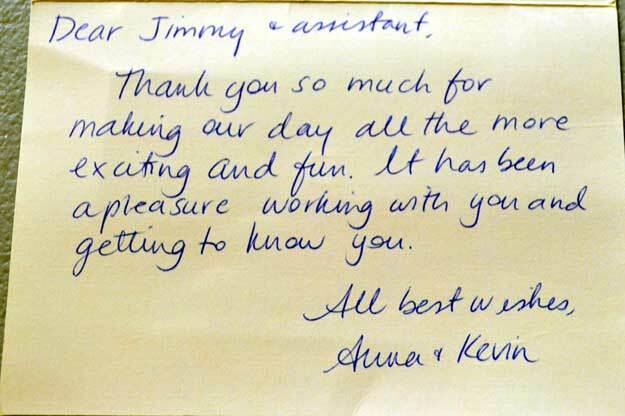 Jimmy was always quick to respond, professional and an absolute pleasure to work with. 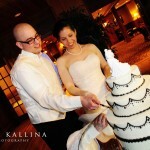 He traveled 2+ hours to our wedding site and was enthusiastic and flexible the entire evening. Several guests commented about the fabulous music and the dance floor was packed from beginning to end. The next day my Mom came to me and said Jimmy took the time to come over to her table and compliment her on her toast/welcome speech. 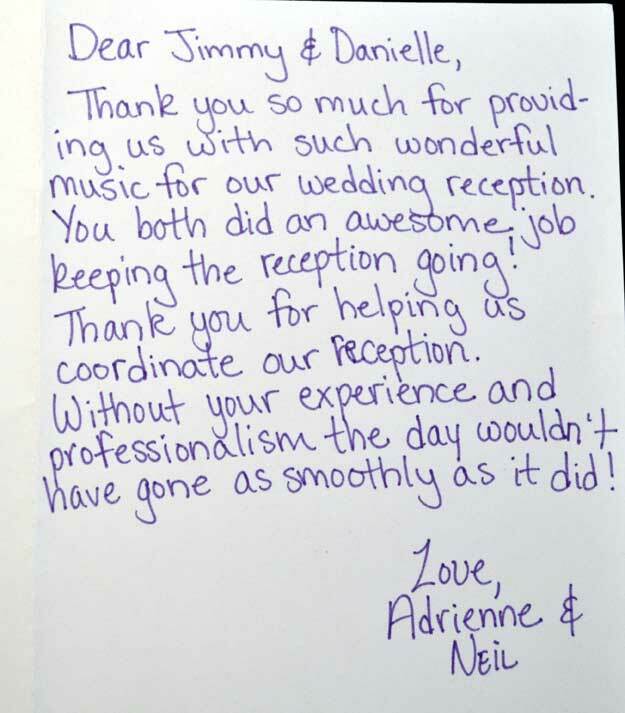 We cannot recommend Jimmy enough – he is first class – you will be so happy you hired him!! 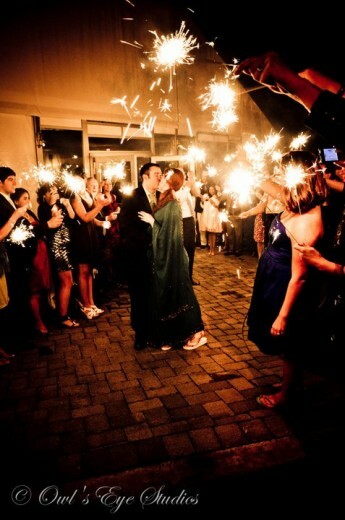 We had a very specific vision for our wedding but didn’t want to spend a fortune. 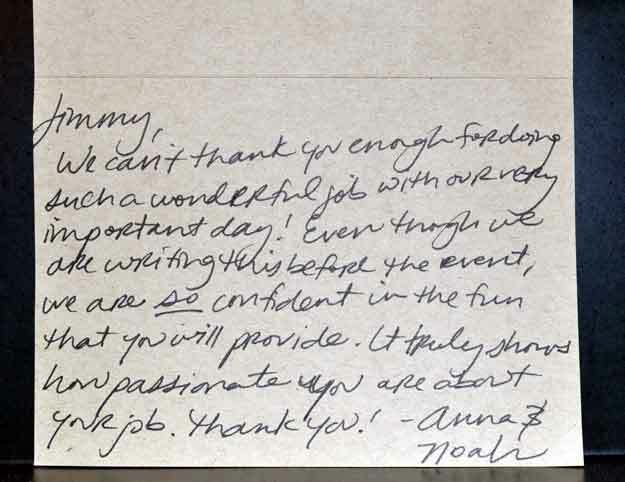 All of our vendors had to be professional intelligent and flexible especially the DJ who plays such an important role in getting all of the guests involved and keeping them happy. 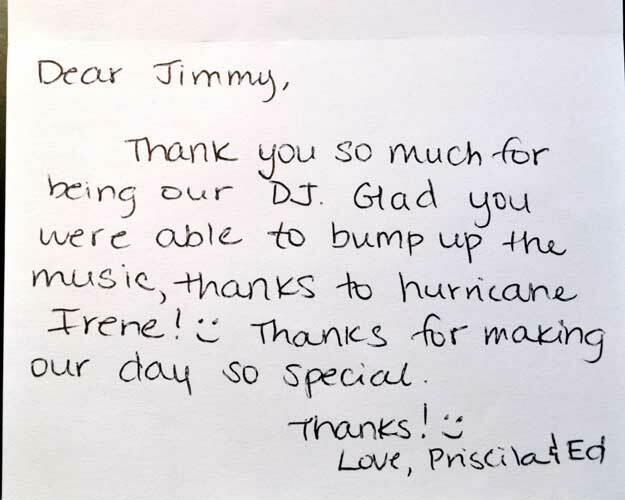 We personally interviewed numerous DJs and ultimately chose Jimmy Lutz because he really knew the music connected with us and gave us confidence that he could help achieve our vision. 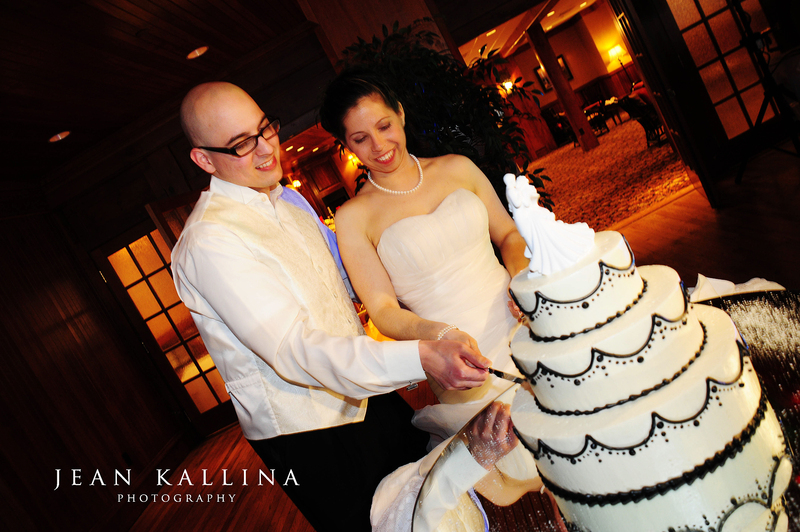 Our wedding by far surpassed our expectations and our guests continue to sing their praises. 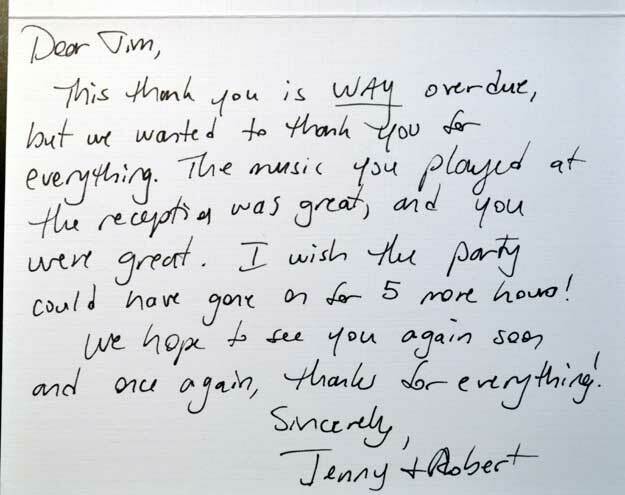 Everyone had a great time and we have Jimmy and the music he selected to thank for that. We highly recommend Jimmy and encourage him to give out our contact information so that we can supply references for any future clients. He is a sweetheart who will bend over backwards to make sure everyone has a great time. Jimmy, you did the best job! We could not be happier with the music or your professionalism! Many people have asked us if they can get a copy of the wedding playlist (both young and old). Do you think this could be possible? Thank you again!